Generally speaking, any image published before 1923 is in the public domain. Additionally, any photographs taken by US government employees, including soldiers and sailors, in the course of their work is also public domain. Another approach would be to go to the Flickr Commons and search “World War I.” That’s what I did to get the picture at the top of this blog entry. TL:DR – You are looking for the World War I Zooniverse/National Archive (UK) project Operation War Diary. You’re welcome. Now that significant numbers of people are using this site, I’m starting to see popular search terms. Your privacy is assured (with me, anyway) because my stats package only tells me WHAT is being searched for and not WHO is searching. In these days of mass surveillance I cannot categorically say that the NSA is NOT getting your search history, but I am not. When I see a topic in this site’s search terms that is both popular and interesting to me personally, I’ll blog about it. For the past four days or so, one of the searches that has led people here is some variant of “Operation War Diary.” Doing some of my own searching I think what you are looking for is Operation War Diary, a new citizen science project on the Zooniverse platform for the UK National Archive and the Imperial War Museum. War diaries were kept for two reasons: to provide an accurate record of operations for preparing the official history of the war, and to collect information that would help make improvements in preparing the army for war. The war diaries contain a wealth of information of far greater interest than the army could ever have predicted. They provide unrivalled insight into daily events on the front line, and are full of fascinating detail about the decisions that were made and the activities that resulted from them. The National Archives has digitised the war diaries of the units under the command of the British and Indian cavalry and infantry divisions on the Western Front. The war diaries are made up of a variety of different types of pages, including cover pages, title pages, orders, signals, maps, narrative reports and the main diary pages themselves. They are catalogued by theatre of operations, unit and the date range covered, but we don’t know much more about the content of the diaries beyond this. It seems like these diaries would be a godsend to writer of stories of World War I or a science fiction writer wanting to set a general tone of army life. Hope this helps anyone searching for Operation War Diary. Who was Hobart “Hobey” Baker? How were balloons used by the allies in World War I? What activities did a deployed officer engage in while not on duty? This work begins with a biographical sketch of Colonel Lahm, then proceeds to his diary. Following the diary is a list of over 1,000 people who were identified by the editors of Col. Lahm’s diary. This “personnel list” begins on page 224 of the PDF file. People get at most two sentences and usually much less. Following the personnel list is a list of military units with page numbers next to them. In the diary Col. Lahm records both work and leisure duties, making this a good work for a writer setting her stories in Europe during the late 1910s . Lahm’s first assignment was the inspection of balloon schools in Britain and France and so might offer a less common view of the First World War. What role did the 82nd play in the first World War? Where can I learn more about the US Army’s role in World War I? Who were the commanders of the US 2nd Division? 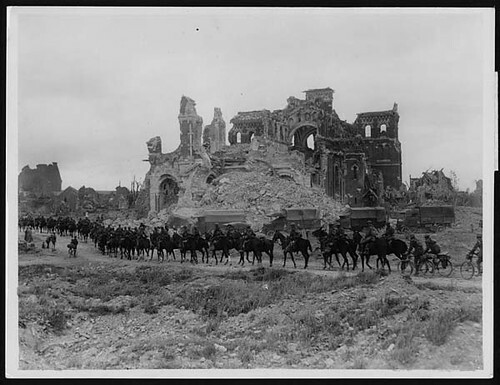 Links to published and archival material related to World War I, including capsule histories of the war prior to US entry and a summary of US actions during the war. Will be more useful for setting the stage for stories of that era than gaining character back story. May be useful for finding names in use during the early 20th Century. What images were invoked to induce people to contribute to the war effort? Were horses still important in World War I? Where can I find an example of a children’s prayer for a deployed relative in World War I? A set of 30 posters in use during World War I.Variety of literary and historical images. Useful to writers in knowing what sorts of images were likely to stir up feeling on the home front. These posters are freely reproducible public domain materials.